What better way to spend a hot summer day than combining fine food with an afternoon siesta, taking an occasional cooling dip? This week we round up some of the increasing number of restaurant pool lounges, just made for living the life. Though positioned on the busy through route from San Antonio to the Bay, Aperture’s elevated first floor terrace gives the feeling of being in a secluded coastal retreat. With sunset views to die for, Aperture offers bohemian chic without pretention. 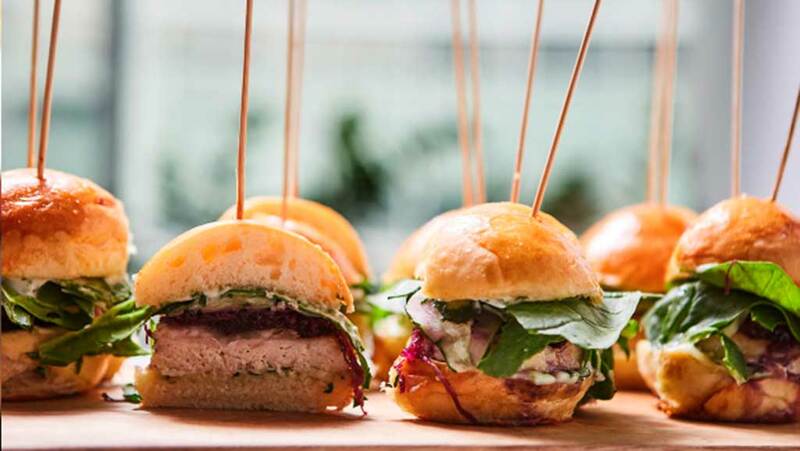 Take a (very modest) minimum spend day bed and nibble on our favourites from the Aperture finger food selection. The selection of four mini burgers—egg, bacon, gouda and gorgonzola, are served with fries for just 7€. For a bigger appetite we love the Tataki Tuna marinated tuna fillets, accompanied by green salad. Aperture have live DJs and music—a good choice is the Wednesday night sunset pool party. Just footsteps from the beach of Cala De Bou, the restaurant and bar extend into a large covered terrace with views across San Antonio Bay and the lights of the Sunset Strip and Marina beyond. 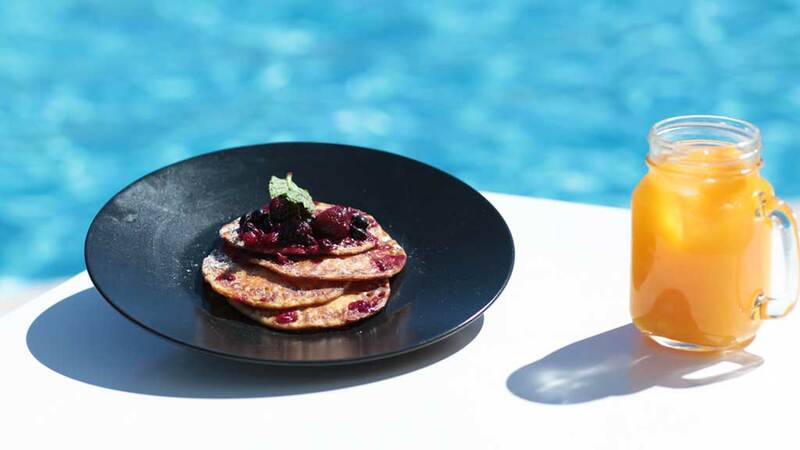 But today we are concerned with outside—the gardens and a private pool with sunbed service are available for the exclusive use of relish patrons, and we particularly recommend you to an afternoon eating from the brunch menu and sipping on their cocktails. Pancakes shouldn’t be this good, and they come in both fruit compote and bacon and honey variations. Pair the pancakes with a bloody Mary, but if it is the full afternoon snooze you are after, it has to be an indulgent massaman curry, a misleadingly reasonable 13,95€ for a traditional thai curry with a subtle blend of hot, sweet & sour flavours served with spiced rice & a coriander flat bread, and the perfect accompaniment of a Relish Mule cocktail—aperol, gin, licor 43, fresh ginger, lemon, chilli & sugar syrup. We have said it before and make no apology for saying it again, the Mariposa will guarantee you one of the warmest welcomes you can ever expect to get. Nestled up in the Pueblo Esparagos hills behind Cala Llonga, Joe, Di, Molly and the rest of the Mariposa family pride themselves of good home cooking. I know I should select one of their very popular salads, or mountainous burgers, but every time I go I can’t resist their brie and bacon toasted sandwich, so tasty it usually turns into two. I can’t just recommend a sandwich in a review can I? 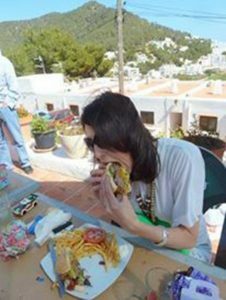 OK back to the burgers, homemade, juicy, full of flavour, and very, very, big. You want proof? My wife will kill me for using this photo—I hope you appreciate the sacrifice I am making here. 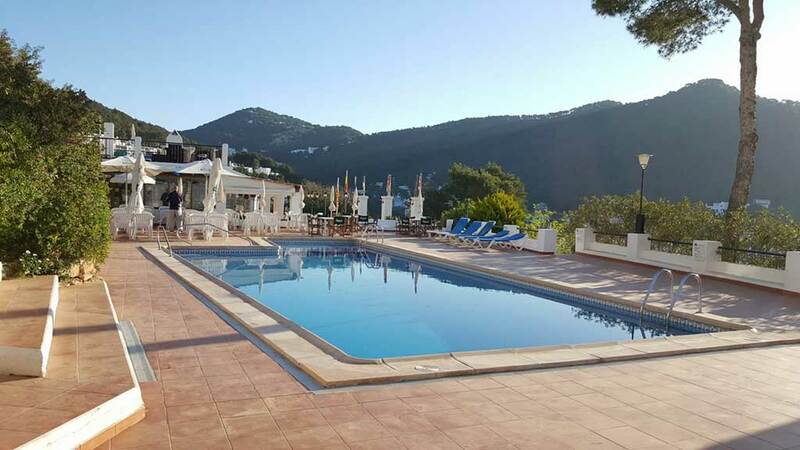 The Mariposa pool is perfect for families with a paddling pool for tots at one end, and surrounded by sunbeds. Food with a pool and a view. The Royal Plaza is another hidden secret. 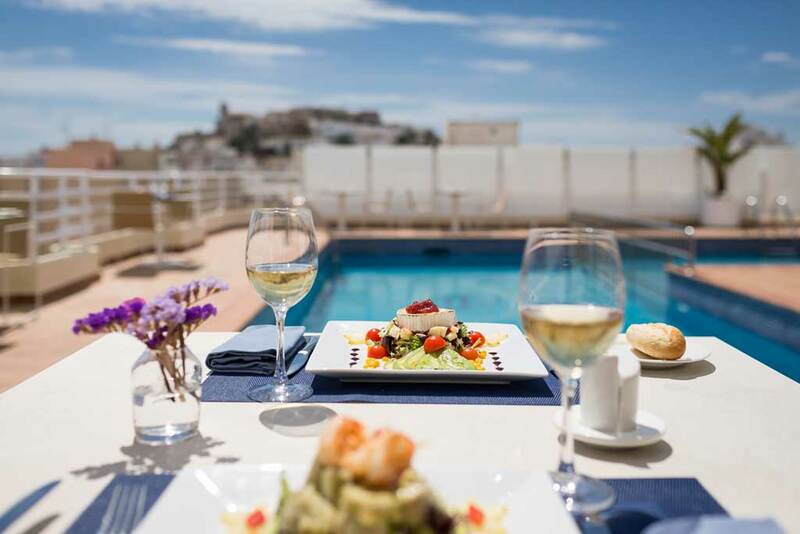 Their rooftop pool and dining area has one of the finest outlooks in Ibiza, and a menu to match. The perfect setting for a romantic get-away, and why not do it in style with one of the Royal Plaza’s special overnight packages, or add on some pampering in the Spa that sits adjacent to the rooftop pool. 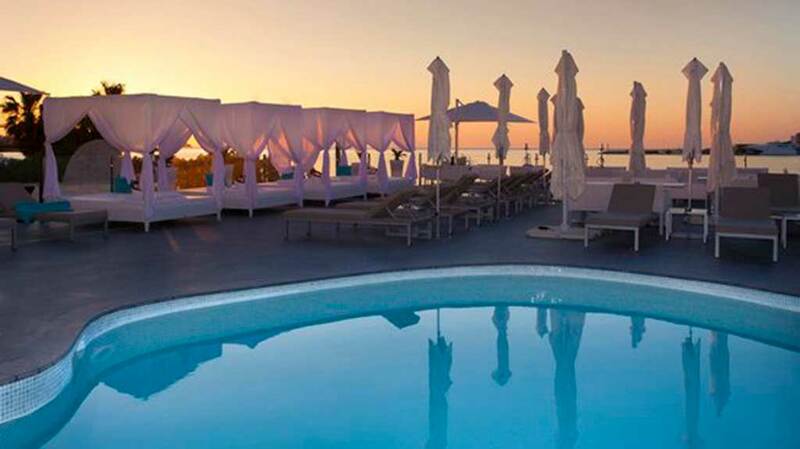 Expect traditional 4-star quality of service, and one of the best days, nights or both, you’ll spend this year. 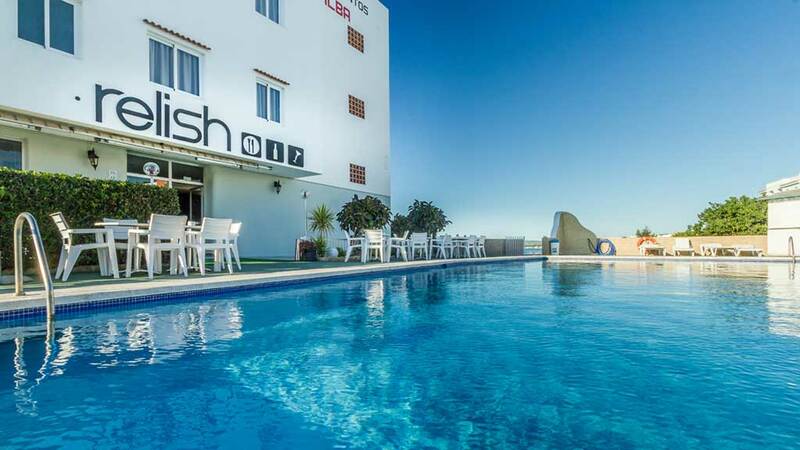 Las Mimosas is the new boutique hotel by Mambo in the bay. Mimo’s is its attached Italian, with a good deal of Ibicenco influence, restaurant. 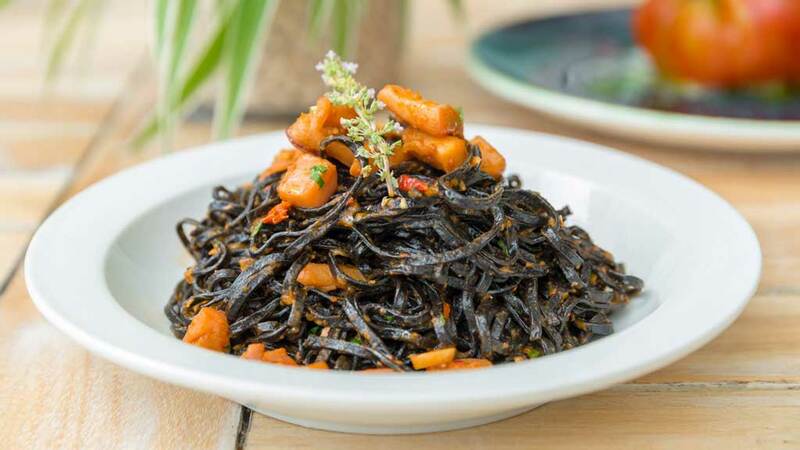 Pictured below is their Taglioloni de tinta de sepia con salteado de calamar ibicenco. Sublime. 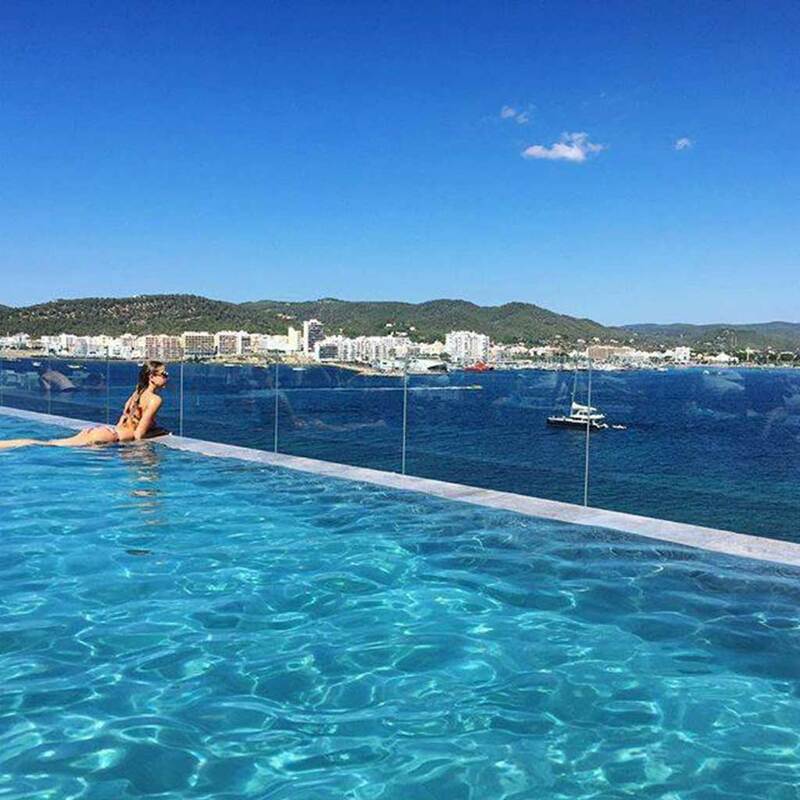 Rooftop nine is a venue special enough to be in my top five places to take Ibiza visitors. OK the service can be a little iffy, staff are probably too busy admiring the view, but even that one small negative seems to be improving recently. We were last there on Wednesday hosting a whistle-stop tour of friends from home, and it gained the usual wow response as they walked out onto the terrace. 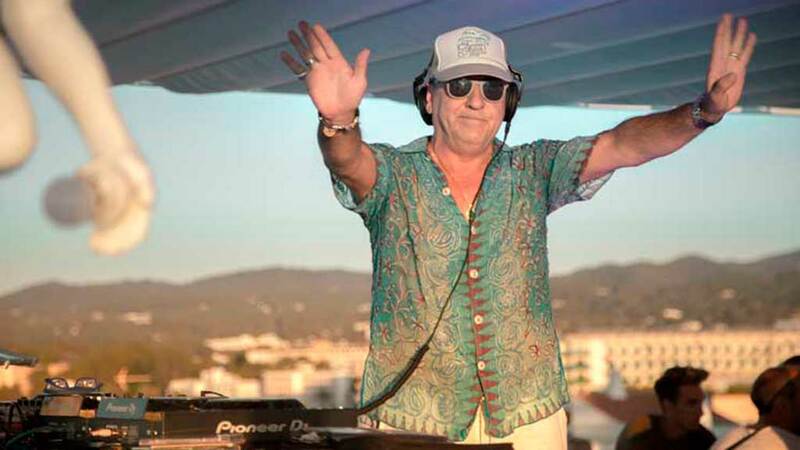 Then an added bit more wow when they found themselves chatting to So Solid Crew—and it isn’t at all unusual to find DJs and artists chilling out on the deck. 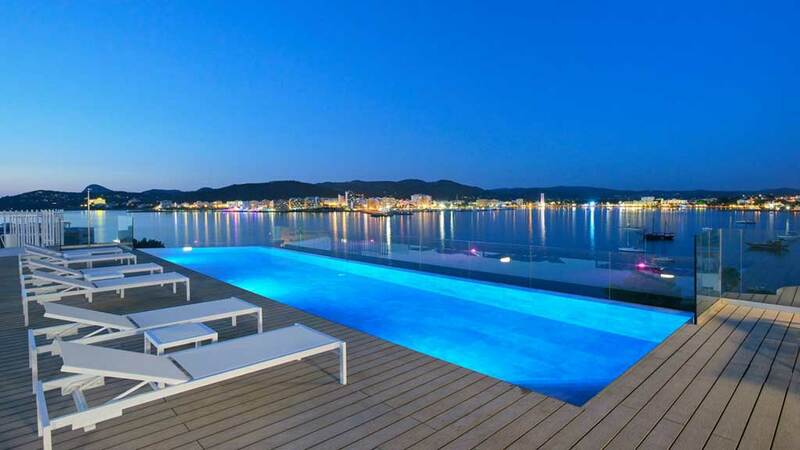 The pool might not be for everyone—the infinity nature of it that is, but most people seem happy on the waters edge chatting over cocktails. Rooftop nine is not as expensive as its situation and clientele may suggest. We had a few very decent bottles of our highly regarded local Ibizan vineyard Can Rich white at 26€ per bottle, and the chaps said the beers were cheaper than any old pub in the U.K.
Rooftop nine’s menu is limited but very good. 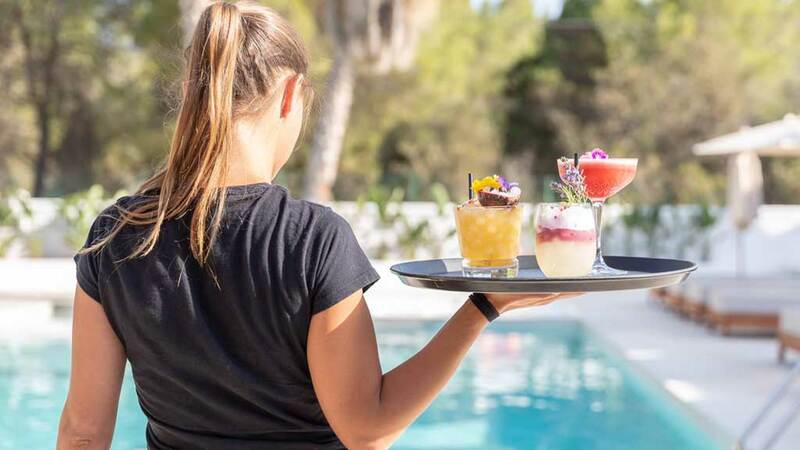 Think hummus, burgers, finger food—basically exactly what you are likely to want poolside on a scorching Ibiza summer afternoon. Next articleNew Record For Ibiza’s Fastest British Hooligan Arrest?